GOOD PLANETS ARE HARD TO FIND. 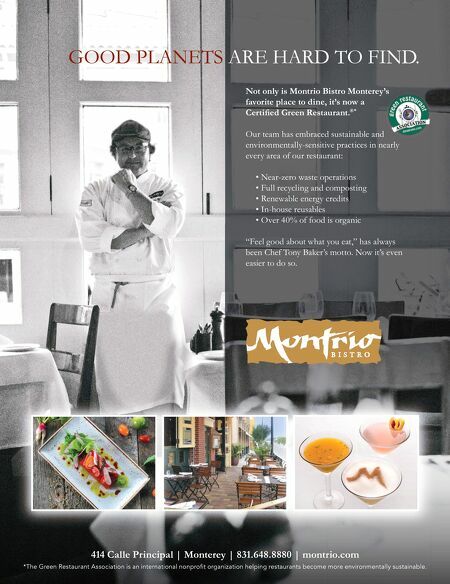 Not only is Montrio Bistro Monterey's favorite place to dine, it's now a Certifi ed Green Restaurant. 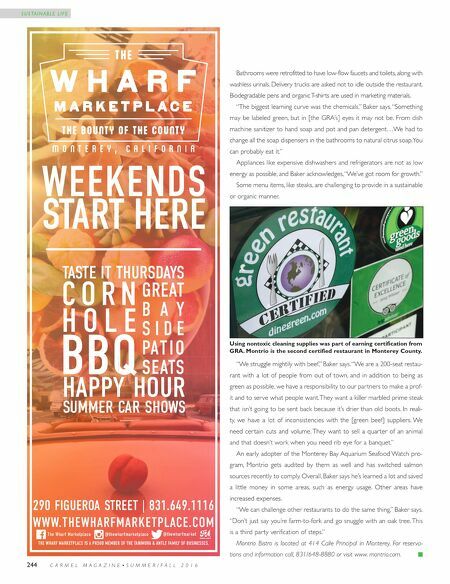 ®* Our team has embraced sustainable and environmentally-sensitive practices in nearly every area of our restaurant: • Near-zero waste operations • Full recycling and composting • Renewable energy credits • In-house reusables • Over 40% of food is organic "Feel good about what you eat," has always been Chef Tony Baker's motto. Now it's even easier to do so. 414 Calle Principal | Monterey | 831.648.8880 | montrio.com *The Green Restaurant Association is an international nonprofi t organization helping restaurants become more environmentally sustainable.